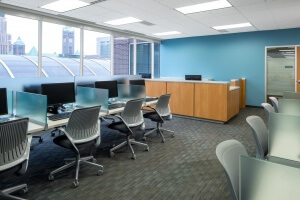 Mohagen Hansen Architecture | Interiors was selected by Hennepin County to provide architecture and interior design for a new Regional Hub for the Hennepin County Human Services and Public Health Department. An average daily client volume of 264 individuals / families are served by a total staff of 312. 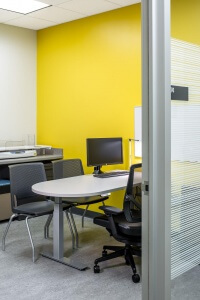 Significant interior renovation work was required to transform the existing 5th and 6th floor office space into a client service operations environment. 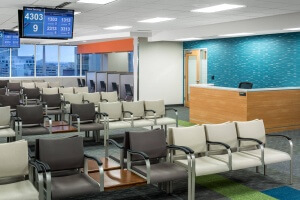 The design team worked within previously established finish standards, and through creative space planning and design, developed an environment that meetd the County’s goal of improving community outreach in a safe and secure location. Currently, the County is strategically locating service center hubs throughout the metro area. 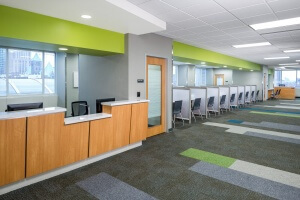 The Central NE Minneapolis Regional Hub offers intake and assessment, financial assistance, health care programs, child and adult protection, and ongoing case management, as well as referrals to other county and community services. Additional specialty services included within this hub are Emergency Assistance, Shelter and a WIC clinic.